Today I tried to translate an idea which suddenly flashed in front of me somewhere in the middle of the night. Why not try Brazilian Embroidery on paper? Conclusion : Very difficult,but not impossible. Since this was a first attempt,I did make some poking and piercing mistakes,which you can see for yourself very clearly if you click on the photograph. So my poor card is rather battered and bruised. The bullions were particularly troublesome. Once the work on the outside was finished,I had another issue to solve - what to do with those threads and knots on the other side? 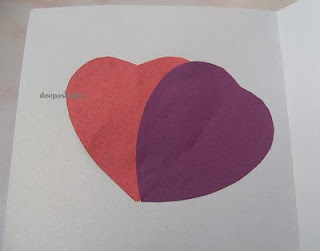 Well, I borrowed my daughter's activity paper ,cut out two hearts and covered it up. This is particularly meaningful considering that this card was meant to be for my uncle's wedding anniversary. 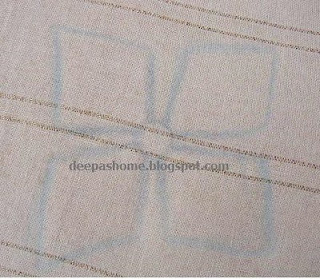 Though this idea has not been a super success,Iam just wondering if I could embroider on cloth and glue it to paper? How does one glue fabric to paper? Can we use the normal glue? Or is there something else? just google embroidery on paper you will see more ideas. Construct your design on another piece of paper, cardboard, or mylar, and position over your card. Then, with a push-pin, puncture a hole through your pattern and into the card beneath wherever needed. Once you've finished piercing the holes, remove the pattern piece, but keep it for reference. 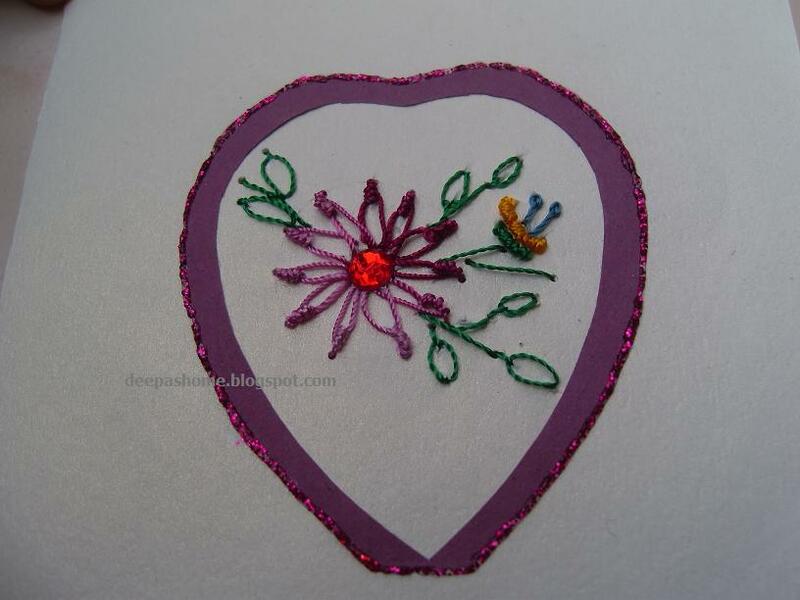 Your card will then be ready for stitching, and there will not be any damage to the paper. It's a good idea to have your card on a soft, thick surface, such as an old mouse pad, for the piercing. I took a class in paper embroidery and have used these instructions often.Hope this helps. You can use fabric glue by Fevicryl to glue your embroidery on paper. Hi Deepa... what a lovely experiment... no doubt difficult, but definitely possible as you say. Yes, you can definitely glue fabric to paper, and basically any regular or craft glue should work, if you have a glue gun, even better. You could even cut out a square on the front of your card, insert the fabric behind to completely cover the hole (gluing it to the back), and then place another piece of glued paper to cover the whole card, thereby hiding your stitching... cross stitchers make cards like these all the time... you can even buy cards with a cut out already, but for cost saving, your craft papers will work just fine. Good job. Hugs! Thanks everyone for the lovely ideas!! Heather,I've to look up what a glue gun is. Nima, isn't what Heather described same as aperture card? I've never made greeting cards,so the terminologies are all alien. Thank you for the wonderful idea.I need to use it coz I kept piercing everywhere except on the pattern..duh!! Thanks to u too Jayashree and Walfrida. 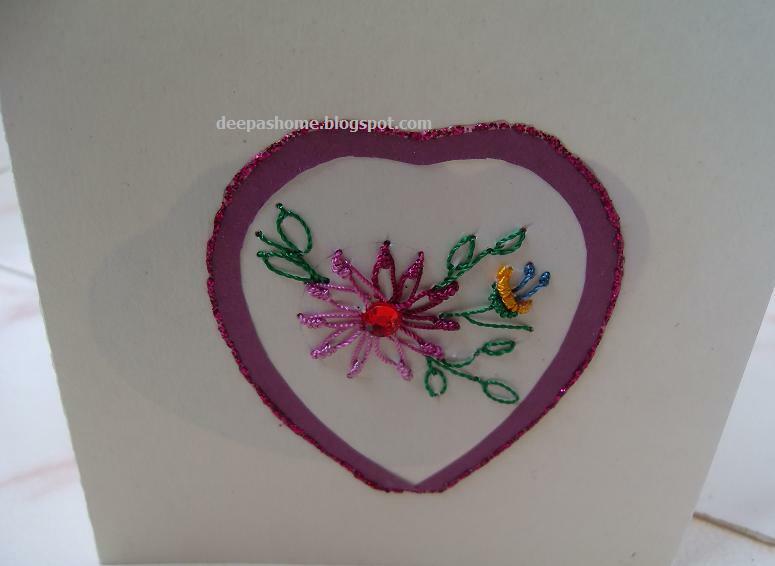 embroider on a cloth and glue it, normal glue will do.I made a card like this sometime bck.. I'm a little late in responding, but this caught may attention as I was catching up. Do your embroidery on fabric and finish the back and edges. Then cut a hole in the card just big enough for the embroidered piece to fit in. Attach it using a decorative zigzag type of stitch connecting the card stock and the embroidery. You can prepunch the holes on the card, if need be. Hi Deepa, Haven't visited for a little while, and thought I would catch up. As usual everything you do is absolutely beautiful. Your card is really nice and like the idea of the two hearts at the back. I am looking forward to seeing the finished peacock BE. Hope your class in Bangalore went well.